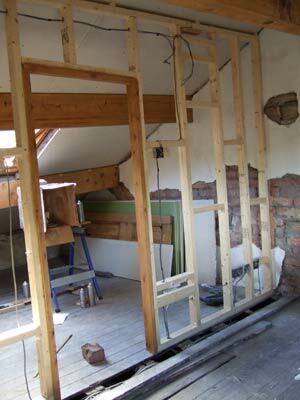 Studio conversion blog part 4.. Studs and Nogginsis.. 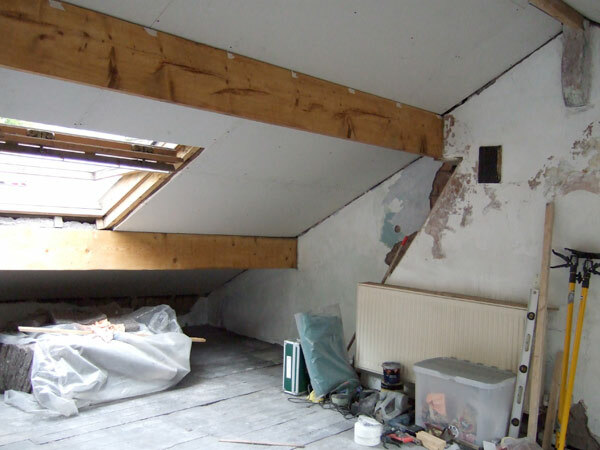 So it was decided that the attic space was so large it could comfortably be split in half to form not only a spacious studio but a fair sized guest / spare / box room… So I did some reading on how to build a wall..
First I need a new door. So out looking for doors we went and soon found a local place that strips old pine doors. A suitably small door was purchased for the attic room and as we were there another three were purchased to replace nasty modern doors eleswhere in the house. Also the fellow came and took our remaining doors away and bought them back a few days later sans-ancient multilayered paint. I still have to sand them down and oil and wax them but thats a lot of tough stripping work I dont have to do any more……. which is nice. So lots of new, old doors..
A bit of maths later and lots of timber was ordered..
Then lots of measuring sawing and swaring.. And a couple of days later I had up all the studwork (vertical pieces) for the new wall as well as the top and foot plates. I then built the door frame around the new mini door and fixed it in place with the first noggin (horizontal piece). Yes they really are called Noggins.. That made me happy. Many more Noggins later and then a few more to fix electrical sockets and light fittings to and I had this. A week or so later and the Electrician arrived to do the first fix (putting in the basic wiring and socket boxes). 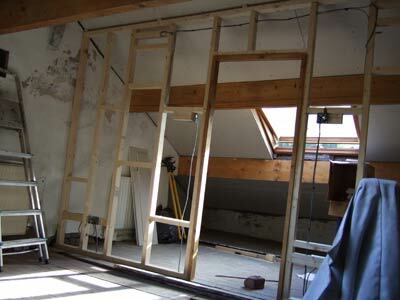 So now its ready for me to start more plasterboarding.. I stained the pine used for the door frame so it matches the old pine in the door better. I must source reclaimed pine for more of the jobs that need doing really..
That’s what they look like up close.. Not too pretty. 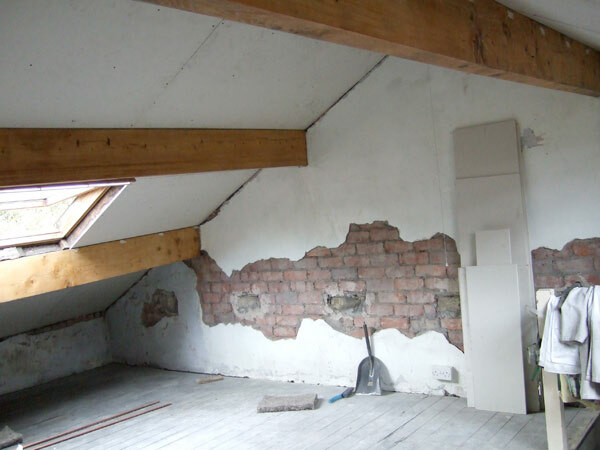 And the morter is all crumbly so it would ALL need replacing to have the wall exposed.. Not going to happen..
Moving forward faster now is the plan.. Plasterer booked for six weeks time.. Lots to do to be ready for him..
Just a note to anyone out there awaiting commission works from me. I have recently been offered a couple of solo shows, which, as I am sure you can imagine I accepted right away. This does however add a mountain of work on top of my existing very large hill of commission pieces and the collosal pile of ever moving sands which is my studio/house renevation. Please bare with me. I will get to you eventually. So after the insulation went up it was time to board out and make it like a room again. 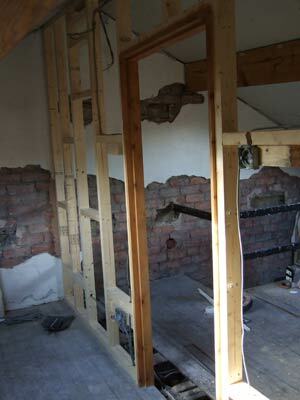 It took me, with help from my splendid father two solid days to get all the plaster boards in place. As suspected there is not a single vertical wall or square angle in the place. Some angles act obtuse when they appear acute! Hmmm like some ancient evil has been lurking here… So lots of trial and error and hundreds of screws. We got quite good at it by the end. It has changed the light quality in the space no end. And the attic is feeling like a room again not a rubble dump. 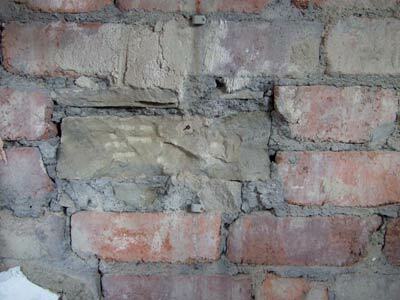 More loose plaster needs to come off the old wall too. There is still a long way to go. But its moving ahead nicely now. 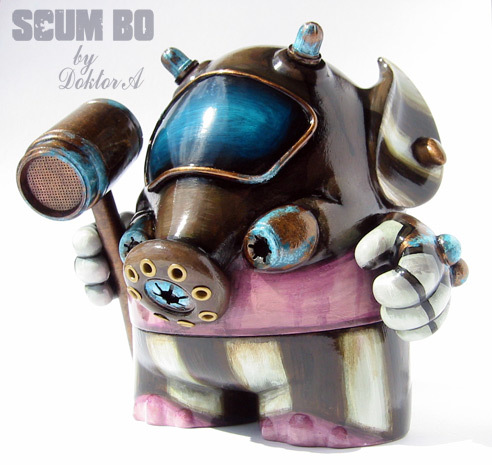 The Hijaked Scumbo custom show was held last night in Devil Doll Gallery in Long Beach California. Lots of great artists and one by Doktor A.
Congrats. And thanks to everyone who entered. Thanks also to “Toys R Evil” for running the comp.